So now we are in that very odd season between Christmas and Chinese New Year. This is when retailers sweep away the Christmas decorations and start putting up red banners and lanterns. I confess I come from a very untraditional Chinese family as we do have the reunion dinner as well as the visiting for the first few days of the new year, but we don’t celebrate the 15th day of the Lunar New Year (“Chap Goh Meh”) or other minor festivals. Because Chinese New Year visiting usually centers around visiting our elders, most of our meals are at our older relatives’ homes. Because of that, the actual celebration of CNY is very quiet in my house, which is why we sometimes escape from the mandatory pre-CNY spring-cleaning. Nonetheless I still try to put up some decorations for the home. I was wandering around some local shops and was struck that the decorations on sale seemed to be particularly garish this year. Perhaps this was in honour of the incoming Monkey year that is more effervescent and colourful in character! So I will probably dig around for some older decorations in the house. Last year I made some “goldfish” decorations which looked quite colourful and spring-like. So I am slowly transitioning from the Christmas season to Chinese New Year and am starting to think of the dishes I might want to cook during this period. Doing low-carb is particularly difficult during the Chinese New Year. Most specialties for the season such as pineapple tarts, love letters, new year cake (“nian gao”), and Yu Sheng (tossed salad with raw fish) are all severely sweet and carb laden. And most savory dishes include noodles or rice. In writing this blog I have always aimed to transform staples in Asian food into a low carb and healthier version, but I confess this is really not possible for some dishes. Take dumplings – the delicate dumpling skins are near impossible to make low carb (although I will try some soy flour dough sometime next week). So recently while mulling over the dumpling issue I decided to make cabbage rolls instead, which, if you think about it, is just a vegetable casing for a meat filling. 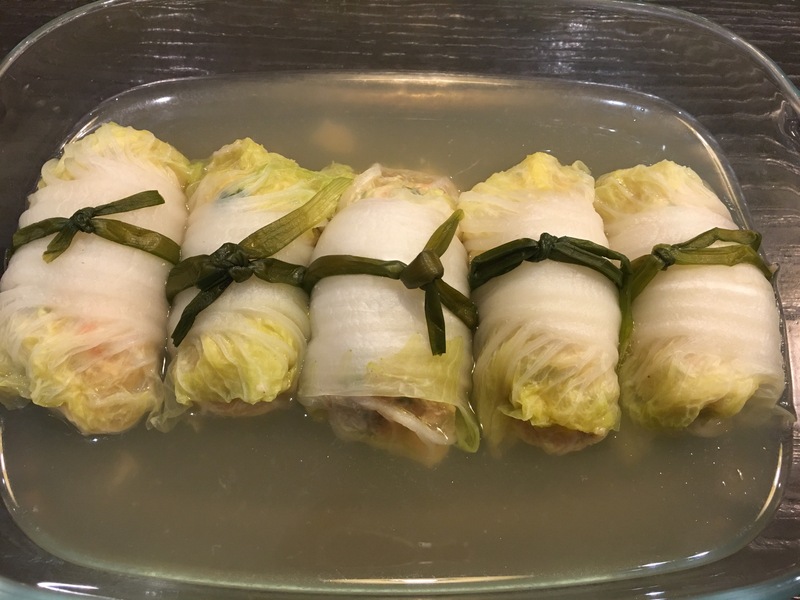 This recipe worked quite nicely but I steamed the cabbage rolls and did not dare to dump the rolls into boiling water the way I would have cooked dumplings. Regardless this was a nice little recipe and I might make it for one of the potlucks we have over the Chinese New Year period. In a large bowl, mix the minced pork, minced prawns, shiitake mushrooms, garlic, salt, pepper, sesame oil, fish sauce and soy sauce together. Take a teaspoon of the mix and microwave for about 10 seconds to taste. Adjust the seasoning of the meat filling as desired. Place 2 tbsp of the meat filling on cabbage leaf, about 2 inches away from the leafy edge. wrap the meat filling with the leafy part of the cabbage and tuck in the 2 sides while rolling the roll along the longitudinal axis of the cabbage leaf. Tie the roll up with a strip of spring onion. Place the cabbage rolls into a deep dish, lining them up in a row. Pour the chicken stock into the base of the dish. Steam over high heat for 10 minutes. Serve hot.